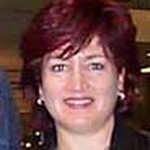 It is with great sadness that we announce the death, on 24th June 2011, of Michelle Brunner at the age of 57. Michelle was not just one of the world’s best bridge players, but one of the nicest people you could ever hope to meet. Always ready for a giggle, she was tremendous fun to be with, and would be her usual bubbly self whatever company she was in – top bridge players, students, friends and casual acquaintances, we will all miss her unaffected friendliness. Michelle was born in London on 31st December 1953, the middle of three sisters. Although her parents played bridge, it was her elder sister who taught her the rudiments of the game while Michelle was in the sixth form. Her bridge education continued at Manchester University, where she read Italian and French, and played with John Holland (who soon became her partner in life, and her husband in 2008) as well as other talented people who still play the game at top level. Bridge was so much more attractive to her than her studies, though, that she never completed her degree course. After a series of jobs in the leisure industry, Michelle founded her Mobile School of Bridge in 1995, and taught beginners and improvers until 2006. She was the author of two very successful Bridge with Brunner books: Acol Bidding for Beginners and Acol Bidding for Budding Experts. Together with John Holland, Michelle also provided private teaching as well as coaching as a professional partner. Her fees, considering her standing in the bridge world, were amazingly modest: she was not out to become rich, she would say – all she was out to achieve was to have her expenses paid so she could go on enjoying playing as much as possible. As a player, Michelle Brunner’s achievements are outstanding. She was a World Bridge Federation Life Master and an EBU Premier Grand Master. She was in the England winning team seven times in the Lady Milne, the Home Countries competition for women’s teams, and she also won the Camrose – the open teams equivalent of the Lady Milne – three times, playing with John Holland as part of the England team. She also won several of the major national competitions at least once. On the international stage, playing with a variety of partners, Michelle amassed an impressive collection of medals in mixed and women’s competitions (pairs and teams): bronze and gold (first with Rosemary Hudson, then with John Holland and Rhona and Bernard Goldenfield) in the Common Market Championships; gold, silver and bronze in the European (first with Rosemary Hudson, later with Rhona Goldenfield – her partner since the late 1980s and a great personal friend). She also gained gold (with Gill Scott-Jones) at the 1985 Venice Cup, the world championship for women’s teams, as well as bronze (first with Pat Davies, then with Rhona) and silver (with Sandra Landy) at the Olympiads. A bright light has gone out in the world of bridge, but all those whose lives were touched by Michelle Brunner will always be the richer for it, and will remember her with great affection and admiration. Our deepest sympathy goes to her husband, John Holland, and her family.